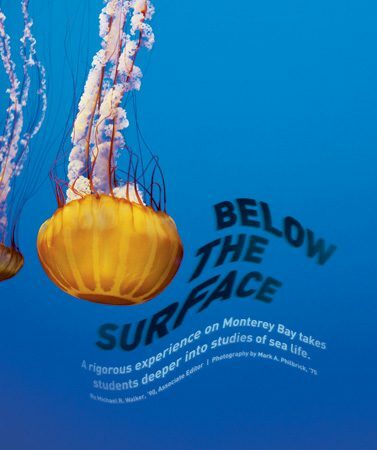 A rigorous experience on Monterey Bay takes students deeper into studies of sea life. A round-eyed harbor seal paddles his way through the glassy green waves of Monterey Bay, keeping a safe distance from the white-topped surf that crashes onto the sharp rocks of the coastline. As he rounds a bend, he stops in surprise and turns to observe a group of 23 humans gathered in a natural amphitheater. Many of the humans—of the subcategory known as BYU students—see the seal but keep their attention focused forward, listening intently to the soft-spoken professor perched on the seaweed-covered rocks below them. Each spring term for the past 17 years, marine biology associate professor Lee F. Braithwaite, ’59, (Dr. B., as he is affectionately called) has led students to Monterey, Calif., to both observe and be observed by marine life. Thanks to Braithwaite’s long-standing relationship with Stanford University, he and his students are able to study at the first marine laboratory established on the Pacific coast, Hopkins Marine Station, founded in 1892. While a multitude of seals, sea otters, and seagulls are constantly visible, the students will spend most of their time studying invertebrates, a group of interesting yet underappreciated creatures that includes strawberry anemones and slipper limpets. It is rumored among some students in the 2002 course that Dr. B. harbors a bias against vertebrates, an idea fed perhaps by his joking disdain after a sea lion or some other sea mammal tries to distract his students. In his research career—which spans some 40 years—Braithwaite has studied everything from bowhead whales to giant sea kelp. 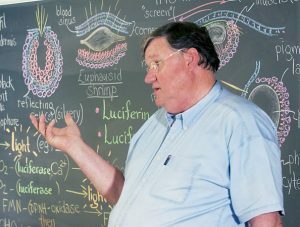 His feigned ill will toward sea creatures with backbones is more a strategy than a character flaw—Braithwaite wants the students to take a look beneath the surface, to go deeper, to see how small invertebrates fit into the structure of life. Class convenes in room 12 of the Agazsi Building, just a sand dollar’s throw from the ocean. In this intensive research program, students attend classes and conduct research here from 8:30 a.m. to 5 p.m. Monday through Friday and until noon on Saturdays. 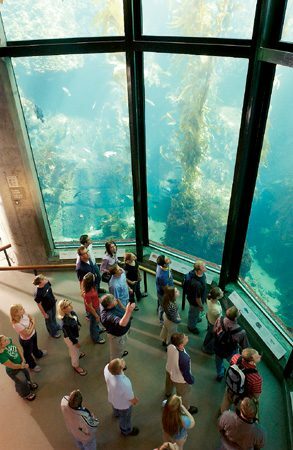 Fresh seawater is piped from the bay directly into this second-floor classroom, providing the professor with live visual aids and students with direct access to specimens. The stunning view of the bay and the sound of trickling water make the room feel like part of the ocean environment. A professional artist, Lee F. Braithwaite, ’59, describes an elusive “vampire squid” to his class using both words and colorful illustrations on the chalkboard. One professor teaching one subject in one classroom could be a tedious prospect, but, thankfully, their professor is unpredictable. Whether out in the seaside environment of Monterey, Calif., or in the classroom, students in BYU’s spring term marine biology program learn to be scientists. “Dr. B. loves to surprise students by coming out of his typical reserved, conservative shell at times. He’ll be all quiet and mellow, then break out with a random song or poem or even an occasional critter dance,” says Melling. 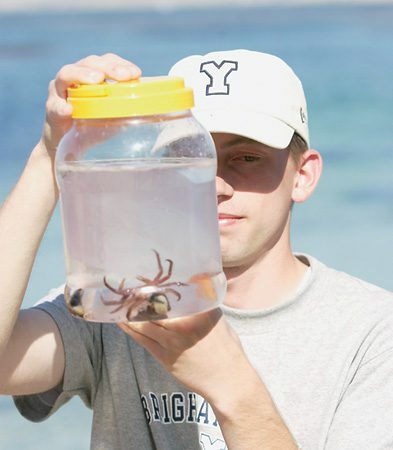 Braithwaite suddenly arranges his arms to create a squid’s mouth and, in a demonstration of its feeding behavior, seeks out hapless student Mary Jane Gygi, ’03, as his nervous prey. When his arms advance and then clamp over her head, the class erupts with laughter and applause. Dr. B.’s classroom antics are legendary in Monterey and in Provo, where he dons man-sized claws and a lobster hat for the ever-popular “fiddler crab dance” in which he demonstrates the male mating ritual of the crustacean. “He seems so serious initially, but as you get to know him, you discover he is a very fun-loving individual,” says former student Brian L. Bingham, ’83. 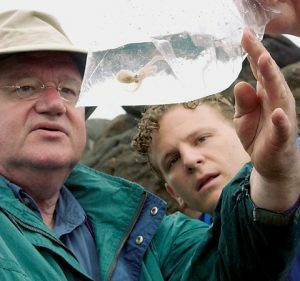 “I think his ‘surprise’ lectures were just a way to help us remember the material, and it certainly worked; you paid attention because you never knew what was going to happen.” Bingham, who accompanied Braithwaite on a similar educational trip to Washington’s San Juan Island in the early 1980s, now teaches marine biology at Western Washington University. At the end of the day, the lights are turned out and Braithwaite shines a black light on the board. The chalk marks glow vividly, indicating the bioluminescent (light-emitting) organs of the squid. Suddenly the black light goes out, and Dr. B. turns the light on himself and provides the class with an unexpected jig. In the afternoon the students go outside to conduct experiments with the wide variety of sea critters housed in the wet lab, a roofed area with open sides and room for dozens of tanks of seawater. They work in groups of four and keep some distance between them; the closely held nature of the projects makes it more interesting when students present their findings at the end of the term. 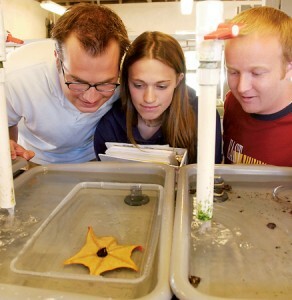 One group of students—Margaret E. Harp, ’03, Christopher M. Pugmire, ’07, Robert K. Loveday, ’03, and Whitney B. Wright, ’03—is trying to determine if a common top snail, Calliostoma canaliculatum, can tell the difference between a carnivorous sea star and less-threatening stars, in this case an herbivorous bat star. They invert the starfish in a plastic container filled with sea water. Harp stands by with the clipboard to tally results while Loveday supplies new test subjects from nearby tanks. 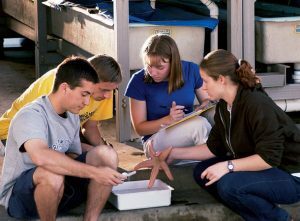 Braithwaite uses live visual aids, and students have direct access to specimens and to the ocean itself at Stanford’s Hopkins Marine Station – offering a dimension of learning unavailable in Provo. Wright drops a snail right in the center of the star—the creature’s mouth—and the group patiently waits for the scene to unfold. At first the snail doesn’t move, and Pugmire notes, “He’s almost in love—chillin’ on the mouth.” Seconds later the snail starts to spin. 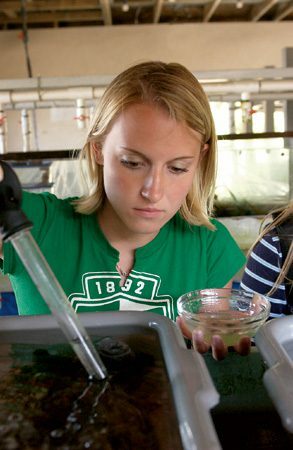 Shawna L. Russell, ’03, conducts research in the wet lab, a roofed area with open sides and enough space for dozens of sweater aquaria. As Loveday collects another specimen from the tank, Pugmire explains what has happened. “If the snail gets scared, first he will flip around, and then he’s supposed to spit out a yellow toxin. We haven’t got him to spit out any toxin yet, but he will flip around. “This experiment is an extension of a research project that was started last year. It is said that this snail—this Calliostoma—can’t sense its predators chemically. We found out that it can sense his predators by chemicals in the water. So now we are finding the range of predators that will attack him, and the different responses he will give to those different predators. Their research techniques are sound—these are serious scientists—but their lively descriptions and enthusiasm illustrates that they are also eager college students having a blast. For students who are accustomed to memorizing and test taking, the Monterey experience can be daunting at first. In the course, students are given a basic research problem with just enough information to work through the solution. Students shouldn’t expect to get advice that is overly prescriptive or detailed; the point of the experience is to learn how to find their own way and solve their own problems. Time after time, they will bring the problem to Braithwaite only to be sent back to the lab with little or no new information. “Dr. B. is sometimes a little bit vague, if you haven’t noticed. It can drive you crazy—but the struggle is worth it,” says Diana C. Brooks, ’04. By inventing methods and devising and revising experiments, and by plugging into their mentor’s passion for marine life, the students learn how to learn and truly come to love what they are doing. At 5 a.m. sharp—a time dictated by the tides—vehicles filled with sleepy students leave the Hopkins parking lot. 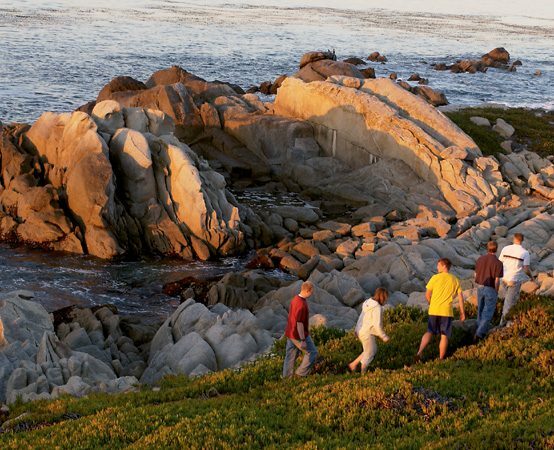 The convoy winds through the wet and chilly predawn toward Point Pescadero, a picturesque rocky shore on the 17-mile drive between Monterey and Carmel. Each student dons hip waders—to ford deep pools—and receives a reclosable gallon plastic bag for collecting interesting specimens. They crawl over a wooden fence and climb down to the rocks below. 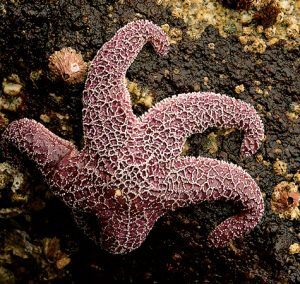 Whitney B. Wright, ’03, Margaret E. Harp, ’03, and Robert K. Loveday, ’03, determine whether a common top snail can sense the difference between a predatory sea star and this herbivorous bat star. In the lightly salted morning mist, tidbits of observation and information float in from all directions as professor and students pick their way carefully down to the water. 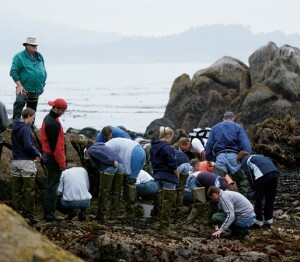 With only a few slips and no serious injuries, the group reaches the edge of a shallow pool to examine a variety of oceanic inhabitants left behind by the receding tide. Braithwaite warns everyone to watch for unpredictable incoming waves. As they crouch over the rectangular depression, their faces mirrored in the shallow pool, the students begin to appreciate what is hidden here among a carpet of colorful anemones, gooseneck barnacles, and red and green seaweed. Their professor—clad in a wide-brimmed tan hat, sunglasses, a light green jacket, and hip waders—perches on the rock above them and poses questions about the tide pool’s inhabitants. 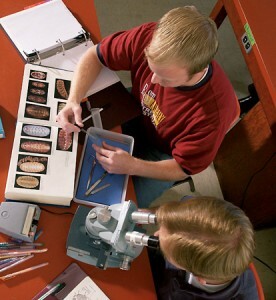 In this intensive course, students absorb information through hands-on experiments. After the surprise quiz, the students scramble over the rocks like exuberant grade-school students on a treasure hunt, stopping frequently to look at the bounty left by the sea’s receding waves. The students bring out their plastic bags and collect a worm, a sea lemon, a tiny octopus, a nudibranch (a petite sea slug with brilliantly colored frills)—miniature discoveries pulled from the thick grasses and the crevasses of barnacle-encrusted rocks. As they work their way down the shore, some of the students stop to count and measure limpets. Others take turns poking their heads inside Dr. B.’s favorite cave. “I discovered this cave when I was a student at Stanford—it would have been about 70 years ago, 75 years ago,” he says with a smile. “Every year I’ve come back to keep track of the succession of the more than 200 species in the cave. 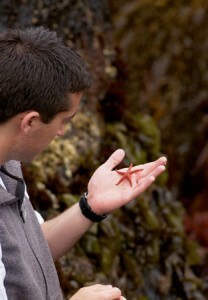 J. Dane Osborn, ’04, examines a tiny starfish, just one of the hidden treasures left by the ocean’s receding waves in the tidal pools. “Inside the mouth there is a purple hydrocoral that grows slightly from year to year. Along the left side as you get inside there will be a lot of flat orange sponges growing. The main space competitors that you see in there will be bryozoans. They are quite dense on the side walls, and if you look on the roof of the cave they will be hanging down as tufts. Braithwaite wants his students to take a deeper look at the ocean and discover how small invertebrates fit into the structure of marine life. “Our interest here is in discovering space competition and also longevity of species. You’ll notice down in the water that the animals are a little bit different because they are rarely exposed. Inside the cave it remains humid so we can see organisms that are normally just found in deeper water. It’s interesting for color and for a great variety of species. An unhurried visit to the shore at low tide with a marine biologist uncovers a world most tourists pass by. Shards of seashells ride calm waves, then softly scrape the sand of the sheltered beach in front of Hopkins. The marine station is part of a national preserve, where nature’s decorations are left for study in their original setting. Some students chat at a picnic table, while others shoot hoops (spelling Hopkins instead of horse) or grab a snack from the “nourishment center” (a locker stocked with candy bars). Down by the water, a group loads gear into a 12-foot boat, ready to take a turn sampling plankton in the bay. They fire up the small outboard motor and cruise past the whitewashed rocks—where black-feathered cormorants preen and smelly sea lions lounge in the sun—to the thick, floating fronds of the kelp beds. Once there they use wooden oars to find a place where they are close to the plants but not entangled in one of the world’s fastest growing organisms—giant stalks that can grow to 200 feet and as much as two feet per day. R. David Norton, ’05, and Amy M. Bonser, ’04, plop a white plastic cylinder trailing a mesh net into the rich, green water. A minute later they haul it up and extract their prize—water dotted with mottled globs of plankton. Norton leans out of the boat and searches through several dark green strands of kelp, grabbing a kelp crab to add to the collection of sea life. Floating in the midst of this immense tangle, where urchins, jellyfish, and sea otters interact, the students find plankton sampling tranquil but also exciting. “There could be a new species in there—they’re found in the plankton all the time,” says Rebecca A. Hyde, ’03. 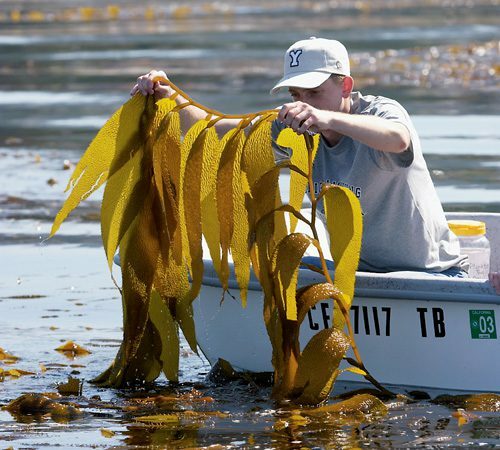 Taking care not to become entangled, R. David Norton, ’05, leans out of his boat to search through strands of kelp. Although all of the students get hands-on exposure to some degree, only a few get the full immersion experience. Three students—Seymour, Hyde, and Brooks—have certified to become research divers. R. David Norton finds a kelp crab to add to the class’s live collection of sea life. With diving suits and oxygen tanks, the divers make their way by car down historic Cannery Row to San Carlos Beach Park. From there they sink into watery spaces, observing interactions in the animals’ homes and collecting specimens for the research groups. When they resurface, their mesh dive bags are filled with interesting treasures, from a giant orange sea star to a sea cucumber to an elaborately adorned decorator crab. 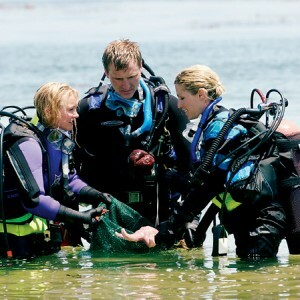 Student divers Diana C. Brooks, ’04, Robert J Seymour, ’03, and Rebecca A. Hyde, ’03, resurface holding mesh bags filled with specimens from the deep. “You go down and you are left with your thoughts and the sounds of the ocean and that’s it. All you hear is the sea life,” says Seymour. “After doing research last year, I really look at who is interacting with who. You get to see it happen. Under the surface, features of the Monterey Bay rival the cliffs of the Grand Canyon. Parts of the 50-mile-long submarine canyon are more than 6,000 feet deep and its nutrient-rich waters feed hundreds of species. The students in Monterey know they only reach just below the surface in their studies by the shore. 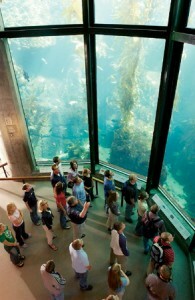 Braithwaite guides his students through the Monterey Bay Aquarium where they study the towering kelp forest exhibit. As the spring term comes to a close, many students have changed their minds about pursuing dentistry or medicine and have become marine biologists instead. Others have made discoveries they say they hope to one day share with their children. All of the students have seen a beautiful and complex part of the world that has changed their perspective on life and learning. Braithwaite’s teaching philosophy and love of the sea change students’ perspectives on life and learning. 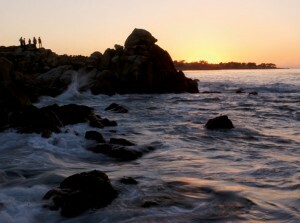 Go deeper into the Monterey marine biology term with a video clip. Braithwaite and John T. Melling, ’04, observe an octopus stranded by the white-topped surf that crashes onto the sharp rocks of the California coastline. As a mentor, Braithwaite builds his students’ confidence and then encourages them to solve their own research problems. So the old crab tried and tried to walk straight forward but she could only walk sideways like her son. And when she wanted to turn her toes out, she tripped and fell on her nose. The moral: Do not tell others how to act unless you can set a good example. 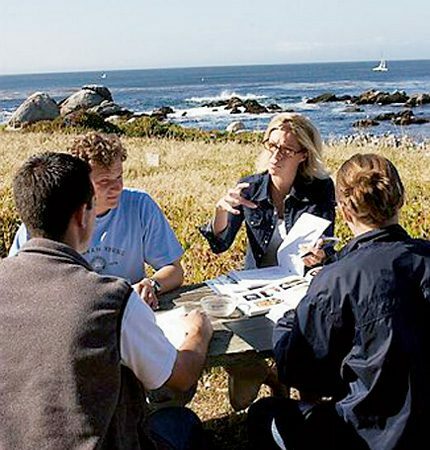 Some 16 hours from Provo, immersed in a different physical and spiritual environment, students in the marine biology term in Monterey, Calif., are offered a chance to learn and grow, tutored by their quiet but impressive friend, professor, and advisor. Braithwaite is on call 24 hours a day to guide them through any crisis, be it academic, physical, spiritual or personal.